It is quite a daunting task to write a profile on a woodturner who has himself made a worldwide reputation writing profiles on woodturners. Thankfully, meeting Terry Martin is a joy. He is a very interesting man with a great sense of humour, who loves a chat. He has a lot to say about turning; although there doesn't seem to be much else he hasn't done, either. Terry Martin has fitted a lot in so far. From growing up in Swan Hill on the Murray River in Victoria, Australia, to life as an international writer and respected woodturner, Terry has had a life of adventure working in numerous countries and learning a number of foreign languages. He now resides close to the inner city of Brisbane, a stone's throw from the picturesque Brisbane River. He has built a reputation as a talented international woodturner, having numerous pieces in private and public collections, as well as having solo exhibitions in Paris and Japan. Terry followed in his father's footsteps by training as a policeman, and took up this profession for a short time before leaving to attend university where he studied literature, philosophy and German. Later he travelled to the highlands of New Guinea and the Pacific Islands to work in mineral exploration. He then travelled through Europe, learning enough French to get by, and working on the ski patrol in Austria. he studied Japanese music, karate and the Japanese language. He returned to Australia in 1980 with his Japanese wife, Yuriko, who has since built a successful career as both a linguist and historian. Terry was asked to set up a training school for theatre technicians in the city of Adelaide, and that is where he first started woodturning in 1983. There was a lathe in the school workshop which nobody knew how to use, so he enrolled on a course on how to turn an eggcup. He got the bug and wanted to learn more, so he spent all of his spare time on the lathe. In 1988 Yuriko took a job in Brisbane, and Terry used the move as a chance to take on turning full time, setting up a small studio at their home in Brisbane. At that time there were not many people in Australia earning their living from woodturning, so it was a very brave move on his part. Terry and Yuriko adopted a five-month-old Korean daughter in the same year. As a well travelled Anglo-Irish Australian, with a Japanese wife and Korean daughter, Terry cites his multicultural understanding as a major part of his development as a woodturner and writer. My path first crossed with Terry's in 1994 when I phoned him about an artist-in-residence program at Uluru in the centre of Australia. I knew Terry had been there a couple of years before, and his advice on what to expect out of the experience was most helpful. Like many woodturners at that time, Terry was turning many natural edge pieces and smaller giftware which sold well in galleries. His journey into more artistic woodturning began to develop in the early 1990s, as I will go on to explain below. Most of Terry's pieces are made from one piece of wood. 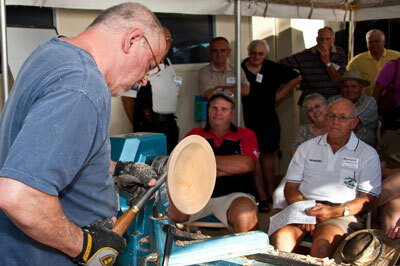 Australian woodturners love using burl timber, especially the rock-hard inland varieties. In the mid-1900s, Terry started his Cyclops signature series: â€œMy Cyclops series was a wonderful breakthrough for me. I started making them in 1995. Because turning was still being typecast as functional craft, I decided to make these to say, "This is not functional, it is an exploration of form and design." 'Ashes to Ashes' is one of Terry's signature Cyclops series. 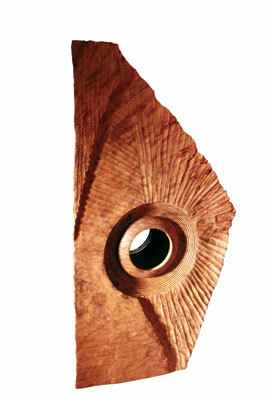 When it is possible, Terry always likes to retain something of the character of the wood in the finished piece. It was made from an unidentified piece of wood that he collected years before. It had been burned, probably in a bushfire, and Terry was speculating that if he had not picked it up at this point, it would eventually have rotted away and returned to the earth. The idea that all wood eventually does that made him think of the traditional burial words: â€œAshes to ashes, dust to dust... "After the turning was complete, he carved and re-burnt the piece to echo the organic decay it was undergoing when he found it. 'Facets', made in 2002, imposes a Cyclops turning on the patterns left by a chainsaw, a texture which Terry loves. 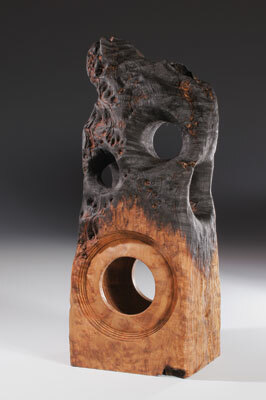 This piece is 460mm (18in) high, so there was a lot of unbalanced wood spinning in the turning process. A pattern was emerging in Terry's work at this stage where he wanted to keep more of the natural part of the large burl blanks. 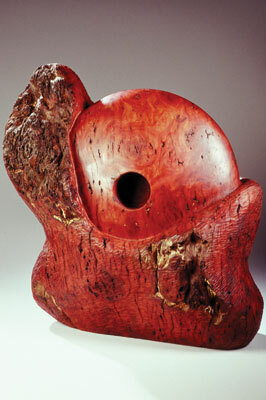 'Emerging Cyclops', made in 2000, is the largest piece that Terry has ever made; it started out as a 200lb block of Jarrah (Eucalyptus marginata) burl at 660mm (26in) in height. "I like the idea that something looks like it was turned, but also looks like it couldn't have been turned," Terry says. "This piece was 100% turned on the lathe, except for a minimal amount of carving to shape the base of the piece. I don't discuss how I did it, because I feel the whole point is to make people think about it for themselves. I like the impression that these pieces grow out of the wood,"says Terry. 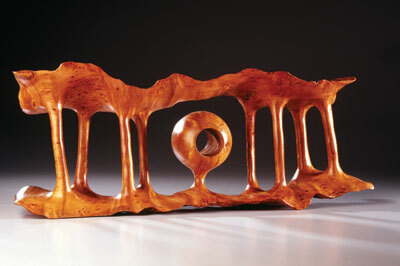 Another theme in Terry's work is the appreciation of the natural materials with which he creates. "This piece was my contribution to an exhibition that was held in Western Australia to celebrate the end of logging old-growth Jarrah forests. It was a cause dear to my heart, and I wanted to say something about the forests; something about seeing them as a special place and not just as a resource. To my surprise, my piece was the only one that said anything about forests; but I got some satisfaction from the fact that my piece was also the only one that sold." Terry says he likes to create pieces that make people ask, "How did you do that?" He explains that he began making pieces like this about 15 years ago when he started dreaming about his designs: "When I dream a piece I see the whole process in one moment and have trained myself to wake up and sketch them so I can remember them in the morning. I love the seeming impossibility of it." 'Impossibowl' is a recent example. 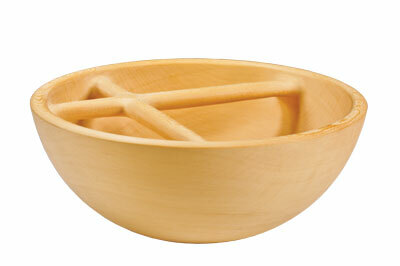 It was turned from one piece of wood, but the cross-bars defy logic because turning a bowl requires full access to the interior. Terry is coy about how he did it because he believes it is best if people stretch their imagination and try to work it out for themselves. 'My Life As A Tree' was Terry's first collaboration with his daughter Yumi. Terry explains: "She has watched me work since she was a baby and now, at 24, I trust her eye better than my own. 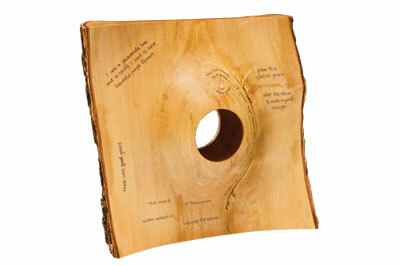 We made this piece to draw attention to the history of the tree as it was recorded in its grain. Everything that has ever happened to a tree is written inside, from quiet years when growth was good, to drought and trauma. In this case the tree was knocked down by the massive flood that swept our city in 2011." Terry's journey into writing about woodworking started in 1992 when he had an article published in the Australian Woodworker magazine. He is a prolific writer with over 200 stories published in 13 magazines. His first book in 1996 was Wood Dreaming, which has since become a scarce and valuable collectors' piece. The book featured the work of Australian woodturners that Terry saw as prominent at the time - my wife Liz and I were most honoured to be included - and gives a great insight into the uniqueness of the Australian trees and bush, as well as what we can learn about these timbers from our fellow indigenous woodworkers. To coincide with the launch of Wood Dreaming, Terry organised an exhibition in Brisbane to show the artwork of people featured in the book. The exhibition then travelled Australia for the following two years being shown in regional galleries. The exhibition was so successful that it broke attendance records in every gallery it visited. Terry curated another 'Wood Dreaming' exhibition for Creations Gallery in Delaware. By this time, Terry Martin had not only carved out a place on the international woodturning stage for himself, but had worked tirelessly to promote Australian woodturning along the way. He has also offered similar help to French woodturners. Terry has been responsible for introducing many of us to the collectors' market in the USA. We should all be thankful for this, as I know I am. In 2008 his second book, co-written with his good friend Kevin Wallace, New Masters of Woodturning was released. It is an excellent book featuring the work of 31 of the world's leading woodturners. The first printing has already sold out and a second print run is now in process. 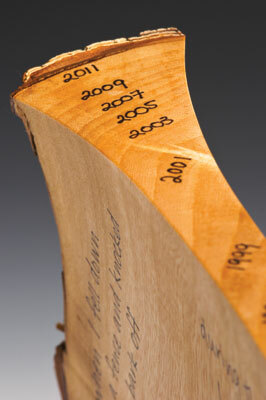 Terry has also written numerous profiles on woodworkers around the world. These profiles not only give a history of the person's journey, but get behind what drives these people to do what they do. Terry aims for his readers to be able to understand the various influences that help develop his subject's artworks. He likes to show the 'why' in a piece, rather than the 'how' it was made. One of Terry's most challenging writing tasks was in 2008 when he was asked by the Rakova Brecker Gallery in Florida to write the catalogue for their 'Icons' exhibition at SOFA Chicago. It was a rare chance for him to research the lives of seven legends in the field of woodturning, and a great recognition for him as a writer. I asked Terry what is on his agenda for the future. He is currently working on another book and has additional ones planned, so writing will take up most of his time, and turning wood will take a background spot. He will turn for special exhibitions, which is good to hear - it would be a pity to lose the talent he has for original designs. He loves to keep contact with his many woodworking friends around the world, and he particularly likes the French woodturners. He admires their cooperative ways and the fact that they like to break rules. Terry has made a real impact on the woodturning world, and made numerous lifelong friends along the way. I am pleased to say that I enjoy being one of them. I'm sure his contribution to the woodturning world is far from finished.